Current Youtube Slam Champion Amy Rainbow learned to write when she was four. Her first published piece appeared in The Worcester Evening News when she was seven years old. Sadly, she still owns a copy of this, along with the badge she was awarded for her efforts. Following this success, Amy took a thirty year break from writing to concentrate on other aspects of life. Other aspects of life sorted, Amy took up creative writing again, and has been published in gems as diverse as the magnificent SLAP magazine, Worcestershire Literary Festival’s A Flash of Fiction, and the faintly cakey WI Life. She has also written factual articles for publications such as Herefordshire Life magazine, as well as producing two access guides to her home town of Malvern. A lover of language, Amy writes short stories and microfiction, and is currently writing her second novel, albeit very, very slowly. Details of her first novel, Jasmine Somers Makes Amends, can be found here. Amy had two flashes shortlisted and then won first prize in Worcestershire Literary Festival’s 2012 flash fiction competition, judged by writing tutor Lindsay Stanberry-Flynn and flash fiction king Calum Kerr, and was shortlisted again in 2013. In October 2012 she won the Warwick Words Flash Slam. Amy also likes to write and perform poetry, most of which rhymes, some of which is funny. She has published her own poetry collection – Poems of the Unrequited, and is featured in the Versatile Productions collaborative Smoke and Mirrors book and CD which was launched at the end of 2011. Amy has supported Bard of Barnsley Ian McMillan, punk poet John Cooper Clarke and the legend that is Attila the Stockbroker, who invited her to perform at his Glastonwick beer, music, poetry and more beer festival in June 2012. Amy has performed at a shiny array of venues and events including Wychwood Festival, The Green Gathering, Camden Jazz Cafe, Birmingham’s Hit The Ode, The British Juggling Convention, Godzilaz Gathering, Stratford Literary Festival, a pocketful of poetry slams and some dodgy pubs. In July 2012, Captain Rainbow’s team stormed to victory in the Lydney Slam, and in August 2012 Amy became Green Gathering slam queen, winning a yard of finest farmhouse cider. In 2011, 2012 AND 2013 Amy was a finalist in the competition to find a Poet Laureate for Worcestershire. Fortunately it is the taking part that counts, and she DID get to perform in Worcester Cathedral, The Swan Theatre and Worcester Guildhall. Amy has won first, second and third prize in recent Malvern Poetry Slams and has now taken on the running of the slam with fellow poet Catherine Crosswell. Amy’s first publication is a dazzling collection of twenty one poems, each one lovingly crafted and hand-picked for your delectation. 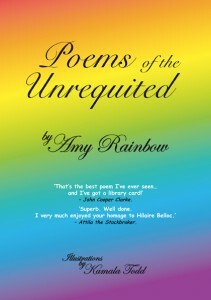 Poems of the Unrequited is a must-have for any discerning bookshelf or coffee table. From juggling fire to juggling men, from killing headlice to killing husbands, this perfect volume will teach you everything you will ever need to know about life, unrequited. Sumptuously illustrated by Kamala Todd, this is quite simply the best poetry collection that Amy Rainbow has ever written. And it has a very pretty cover. Why not buy one for someone you love? Or for someone you don’t? Why not buy several? Pick a number and click here to purchase Poems of the Unrequited. Thanking you kindly. ‘Superb. Well done. I very much enjoyed your homage to Hilaire Belloc.’ – Attila the Stockbroker.